Teachers have guidelines and circulars on how to punish a students who has violated the schools rules. Slapping is never in the guideline. The teachers has violated the Education Ministry’s guideline. The teacher should be questioned and punished accordingly by the General Orders. I wonder is there a guideline for slapping if one fails to recite their “doa”! A very good editorial on the Orang Asli. It sends home the message that these original “sons of the soil” or bumiputras have been neglected by their “trustees” for far too long. After 55years of independence, the Orang Asli remain left behind and have not been amalgamated with the other races. They do not seem to have been given even the benefits and perks of the other bumiputras, and have not been part of the socio economic progress enjoyed by the other races. However, with their sizeable population of 150,000, the Orang Asli can be a force to be reckoned with. What they need is a sincere and dedicated leader to champion their rights and demand for a comprehensive programme for the development of their community. 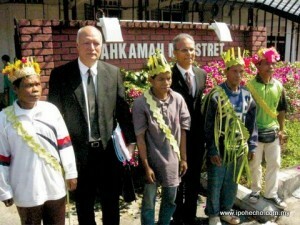 Hopefully, the impending 13th General Elections will bring a genuine leader for the Orang Asli! The last para sounded awful though.